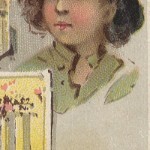 NOTE: There appear to be 2 printing varieties for this card, distinguishable by the presence or absence of a caption beneath the portrait of a boy in the upper right corner of the card. 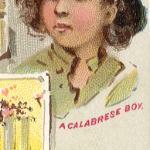 Card has a caption beneath the boy's portrait that reads "A CALABRESE BOY." Card has no caption beneath the boy's portrait. 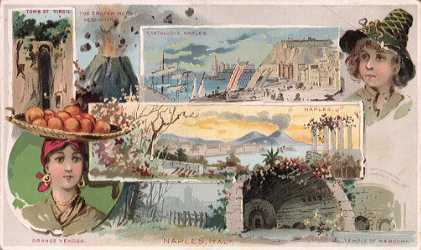 (This is the variety shown on the full-size card, above). Naples is very ancient, having been founded by a colony from Greece, the name Neapolis signifying "the New City." The Greek language, manners and customs prevailed exclusively for a long time. The location is one of great beauty, partly seated on a spacious bay upon the shores of which are magnificent villas and gardens. Its general form is oblong, and with its suburbs, nearly 18 miles in circumference. On the east stands the isolated summit of Vesuvius, its sides to near one-third its height dotted over with houses, the villages of Portici, Resina, and Torre-del-Greco lying below. On the other side is the hill of Posilipo with the tomb of Virgil. The city is situated on the slope of a range of hills fronting the south and east. Its entire aspect is pleasing, the principal streets wide and well built, the public edifices so lofty and solid as to give it an air of grandeur. The streets are paved with square blocks of lava laid in mortar, and are said to resemble the old Roman roads. The houses are like those of Paris, except being on a larger scale, the ground floor being used for business purposes, the upper portion for dwellings, the roofs serving as promenades. The finest street is the Via Roma, extending half the length of the town, having at one end the Largo-Mercatello, and at the other the Royal Palace. There are 300 churches, many of them containing remarkable works of art. The Museo Nazionale, with its vast number of apartments, has become the general depot of all the riches recovered from the buried cities of Pompeii and Herculaneum, as well as other localities of Naples and Sicily. The Observatory, founded in 1812, commands a magnificent view in every direction. The University of Naples was founded by the Emperor Frederick in 1224.